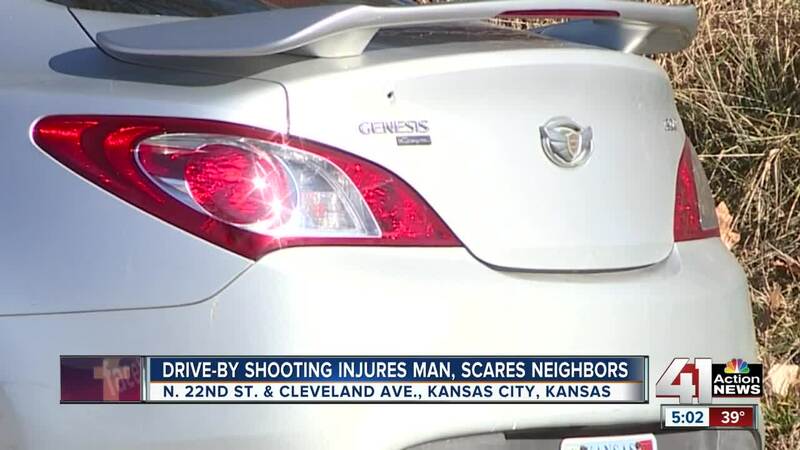 A man is recovering in the hospital with critical injuries and a neighborhood is on alert as Kansas City, Kansas, police investigate a drive-by shooting that occurred early Sunday morning near North 22nd St. and Cleveland Ave.
KANSAS CITY, Kan. — A man is recovering in the hospital and a neighborhood is on alert as Kansas City, Kansas, police investigate a drive-by shooting that occurred early Sunday morning. Shortly after midnight, someone fired at a residence near North 22nd St. and Cleveland Ave. across from Klamm Park during a party at a house. A Hispanic male was struck and suffered critical injuries. Residents at the house declined to go on camera, but told 41 Action News that the shooting victim is a friend. Once the shooting took place, everyone ran out and left, so it's unclear if the shooter knows the victim or if it was random, a resident said. Neighbors said they heard the gun shots, and bullet holes were visible on exterior of the house and the trunk of a car parked outside. “I was asleep and I heard a few things like gun shots and I was kind of surprised and I just went back to sleep, like I didn’t want to know what happened, like I didn’t want to get freaked out,” said Augustin Medina, who lives nearby. “I was just nervous, I was kind of shaking, like I didn’t know what was going on, like it was kind of loud." Medina’s grandmother, Leona Ayalla, also was nervous about her family’s well-being. “My daughter lives in here and I was really worried about her and my grandkids,” Ayalla said. Neighbors are glad they are safe, but they want the violence to stop. "It needs to stop, because it's always going to be someone’s child or someone’s brother or sister,” Ayalla said. The unidentified victim remains hospitalized, according to police. KCKPD does not have any suspect information but asks anyone with information to call the department at 913-573-6139.